Rogue River, OR (January 6, 2016) – Wagner Meters announces the exclusive release of an online Service Temperature Estimator webApp that easily and quickly estimates the relative humidity (RH) at service conditions from concrete at non-service conditions. Now, flooring experts and general contractors can access vital information to help determine realistic project deadlines and ensure compliance with the ASTM F2170 standard for concrete slab RH measurements. More importantly, properly conducted RH measurements will decrease the risk of moisture-related flooring problems, costly delays, callbacks, and even lawsuits. The Service Temperature Estimator webApp, via a licensing agreement with the CTLGroup, is now available for all Wagner Meters customers. You only need four things to estimate the expected in situ RH at service conditions when using the Service Temperature Estimator webApp: online access, the cement to water ratio, the in-situ RH measurements of the concrete, and the current non-service condition concrete slab temperature. Enter the target service condition temperature, set the water to cement ratio, enter the measured non-service condition RH, and enter the non-service condition slab temperature. Click calculate and instantly see the corrected, or estimated, service condition RH. Getting this early estimate of the floor’s moisture condition, along with conducting the RH testing in compliance with the ASTM F2170 standard, will help ensure the success of each project and decrease the risk of moisture-related flooring failures. Such failures, according to the Portland Cement Association, result in millions of dollars in damage annually to buildings in the United States. 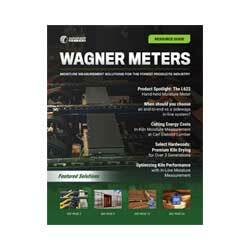 Wagner Meters emphasizes that the Service Temperature Estimator webApp is for estimation purposes only. Before installation of a finished floor on concrete slabs, the ASTM F2170 standard mandates a service condition RH test. The acceptable level of RH is dependent on the flooring product and determined by the manufacturer. For more information about Wagner Meters’ full line of Rapid RH® products for fast, accurate, and cost-effective measurement of concrete moisture, visit www.RapidRH.com or call (541) 582-0541 x235.